Decadenz - for all your chocolate fantasies - CHOMP! SLURRP! BURP! When was the last time you did something for the first time? I am always so inspired by this quote by John Maxwell, challenging conventions everyday, coloring outside the lines and shelving the mundane. Decadenz expresses these emotions mingled with sinful chocolate jars and bringing to life their childhood hero, Willy Wonka’s adventures. 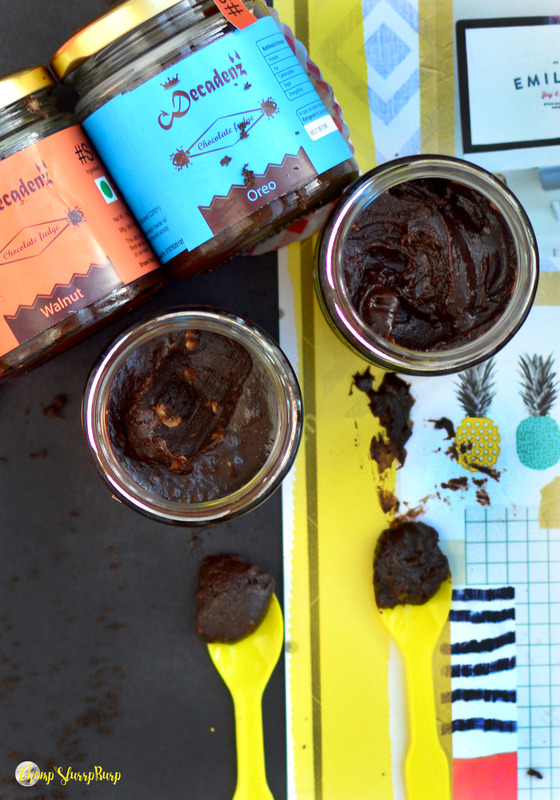 Decadenz aims at fulfilling your chocolate fantasies without the mainstream desserts – they have come up with a variety of chocolate fudge jar spreads – team these up with dry cakes, crackers or smaash it over some toast or eat them the best way – right out of the jar. I tried four of their best sellers – Oreo, Mint, Walnut and Hazelnut Praline – each chocolate jar is generously dowsed with crunchy flavours – a nice churn of oreos, a minty after taste giving of all sorts of “After Eight”throwbacks, chunks of walnuts and hazelnut. The sinful, tantalizing jars come with a smooth and profound texture and very truly justify their #sinisin tagline. If you are not much of a sweet tooth, it will be best for you to savour these with a piece of cracker or smeared on toast. Decadenz is based out of Gurgaon and offer convenient delivery options. So get going and get your pick now. My favourite is the Oreo – because chocolate + more chocolate = satiation.